Pinterest – one of the most popular social networks recently – has proved its indispensable role in the business world. It boosts business marketing. It increases web traffic. But that’s not the end of the story. Pinterest also has a great impact on design trend these days. The designers of Pinterest must be respected because of their unique layout invention. 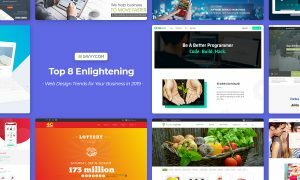 Basically, a Pinterest design is the reflection of a bulletin board, but it surprisingly inspired a new web design trend . A wide range of large websites in different fields, from online magazines to products and services companies, pursue the grid-style layout for their web design, which reduces text but publishes more images. With that image-focused layout, webmasters are able to create and curate, organize and compartmentalize ideas or sets of pictures in a viewer-friendly way. In the mobile environment, a Pinterest-like design is also adopted more and more frequently. The bulletin board appearance is suitable with mobile devices’ small screen. Applying this type of design to a mobile app, designers don’t have to struggle to find out an effective design style. One of Pinterest-like app is the one named “Get It Now” – an app for ordering food, groceries and office supplies. Thanks to Pinterest design style, users of this app are able to make order within 3 touches: select the product to be ordered, select the quantity of the product, and submit. The interface based on Pinterest design simplifies a process of shopping, which benefits both the company/service providers and the users/customers. Another advantage of Pinterest-like design is a more visual experience which makes viewers feel more comfortable. For example, viewers can read content from the article from a plain white window popping up, sharing the story on a social network, and even show emotions in the comment such as like dislike, LOL, eating, watching a movie, and so on. So, are you going to adapt Pinterest – like design in your next app development project?